Humanity is connected through our art and literature even though politics and geography divide us. Kolkata: Humanity is connected through our art and literature even though politics and geography divide us. That was the message sent out at a recent event attended by Nobel Laureate and renowned economist Professor Amartya Sen. Speaking at the occasion Professor Sen came out in full support of actor Naseeruddin Shah, who recently got into a controversy when he expressed concern regarding the rising mob violence in India and had also spoken against the alleged crackdown by the government on NGOs. Since then the veteran actor is facing the wrath of right wingers and even the ruling Bharatiya Janata Party (BJP)’s leaders. One BJP MLA even went on to say that if he were to be made a minister he will bomb such people who speak about intolerance in India. Earlier intellectuals of Kolkata had expressed support for Naseeruddin Shah and had even called out Bollywood for not coming out in support of the legendary actor. Regarding the change of RBI governors in quick succession, Professor Sen didn’t elaborate much, but simply stated that they have been removed as the present government didn’t like them. 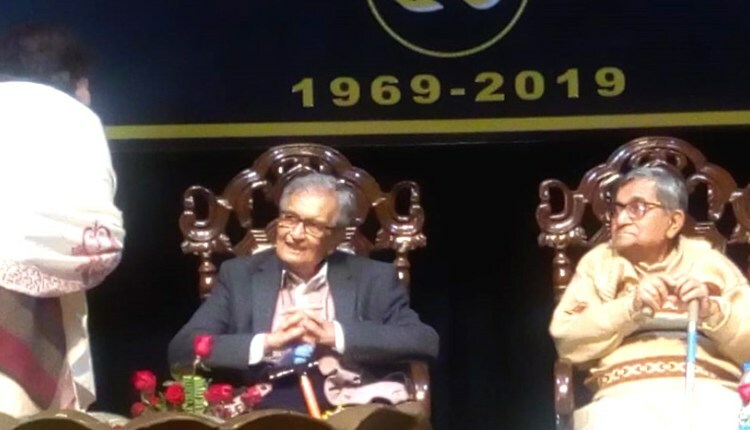 The 85-year-old renowned economist was in town to attend the golden jubilee celebration of a Bengali magazine Samatat. He addressed a gathering at Purbashree auditorium, EZCC on Sunday evening. Along with Prof Sen, Indologist Nrisingha Prasad Bhaduri, singers Srikanta Acharya and Sraboni Sen, elocutionist Ratna Mitra, Mayor of Bidhannagar Corporation Sabyasachi Dutta were also present at the occasion. Elaborating further on this Professor Bhaduri said that our folklore are the same stories that have been found in an Arabic book ‘Tuti Nama’ in Arabia which had probably travelled from India. From Arabia these folklores travelled to Italy and then to England. “The well known book of English literature, Chaucer’s Canterbury Tales, are a collection of such stories that have their origin in India. I was surprised and so happy to see it,” said the Indologist. On the occasion of the 50th anniversary celebration, Samatat has published a 400 pages book where the best articles that created storm in the literary world were republished along with some new articles.